On the morning of March 24, 1934, at approximately 4:45 am, the cook preparing breakfast at Lynchburg, Virginia’s Federal Transient Bureau spilled grease on a stove burner as he was cooking sausage and gravy. The stovetop flare was extinguished but not before it sparked a blaze that climbed the abandoned elevator shaft that had been converted into the kitchen. The fire quickly spread to the second floor and the roof, ultimately killing at least 19 men and injuring at least 70 others. Transient Bureaus were a form of federal aid instituted in the New Deal, by President Theodore Roosevelt, to help communities inundated with men traveling the country when rumors of work surfaced. Operated by the Federal Emergency Relief Administration, the bureaus were designed to relieve pressure on local relief agencies. Lynchburg’s shelter was one of eight in the state of Virginia. Opened on December 18, 1933 in a 2-story building at the corner of 12th and Church Streets, in downtown Lynchburg, it fed and sheltered men during the Great Depression. The building was originally built as retail space but was retrofitted to provide shelter to 100 men, separated by race. On the morning of March 24, 1934 it sheltered 190 men, 83 white and 190 black. The cook attempted to extinguish the fire plus woke the night superintendent to unlock the storage closet containing more fire extinguishers. The superintendent began yelling “fire” in the over-crowded sleeping areas in an attempt to wake the sleeping men. The windows of the building had been covered with wood and cardboard to provide privacy. The barriers were meant to be removable but many were stuck, providing a deadly barrier when the stairs became too clogged with men, smoke and flames. The building did not have any fire escapes. A patrol officer called the fire department about 5:05 am. It took the Fifth Street Fire Station less than 2 minutes to reach the scene. It was difficult for the fire engines to be positioned near the burning building due to the number of injured men who were filling the streets and sidewalks as they lay bloodied and broken or were continuing to jump from the windows. Two men were found dead on the sidewalk. Seven of the men are buried in Old City Cemetery. The Transient Bureau’s records were salvaged from the fire, but many of the telegrams sent to the families came back unclaimed. It seemed the transients had lied about their family or home address out of embarrassment. The Federal Transient Bureau fire remains to this day as the deadliest fire for a single blaze in Lynchburg’s history. After the fire the federal government mandated several changes in the operation of homeless shelters. Fire extinguishers were mandated in sleeping areas of all Transient Bureaus across the country. The minimum space between cots or bunks was regulated. A minimum of two unobstructed and lighted exits from each sleeping area were required. The night watchman or superintendent was to patrol the premises every 30 minutes and had to be trained in fire prevention and suppression. The city of Lynchburg mandated that fire escapes were required on all shelters at least two stories tall. The fire became one of the catalysts prompting the formation of the all-volunteer Lynchburg Life Saving and First Aid Crew. The Lynchburg Life Saving and First Aid Crew operated in tandem with the Lynchburg Fire Department until 2012. The LLSC now teaches those in the community CPR and life saving techniques. On Saturday, March 24, 2018-the 84th anniversary of the disaster-a historical marker was dedicated at the corner of 12th and Church Streets. The marker recounts the tragedy and its effect on the Lynchburg community. Some information contained in this blog is attributed to The News and Advance, March 24,2018. A reconstructed Water Bearer statue was unveiled at the official opening of Lower Bluff Walk last week. Lower Bluff Walk is part of the city’s emphasis of a pedestrian walkway where residents and visitors of Lynchburg can stroll, gather, enjoy food and music and take in the sweeping views of the James River. The historic, seven-foot tall, approximately 300-400 pounds, zinc statue was put on display at the Lynchburg city reservoir, at the corner of Clay and Seventh Streets in 1883. 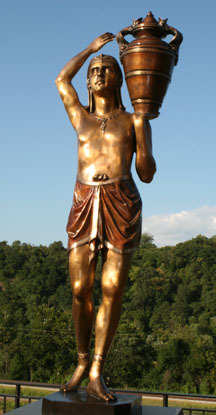 The original Water Bearer was purchased from a catalog for $500.00 was the first public art in the city. and was to commemorate the opening of the city reservoir in 1829, after a dam was placed across the James River and a canal leading from the dam to the water wheel-powered pump station that supplied the water to the reservoir was completed. The female figure, perhaps Egyptian, stood balanced on one foot with a large jug of water on her left shoulder. By 2012 the Water Bearer lay broken in many pieces. Stress fractures were found on the ankles after standing more than 130 years. The statue’s reconstruction and its cost were hurdles the Lynchburg Historic Foundation were willing to tackle in order to bring a part of Lynchburg’s art history back to life. After successfully raising $40,000 for the restoration project the real work began. After carefully examining the original zinc water bearer it was decided that it couldn’t be repaired so the Foundation hired an artist to re-create the original statue using the original pieces as molds for the new bronze statue. The artist from Alexandria, VA, who taught himself to sculpt,decided he would recast it in bronze, calling bronze “a forever metal”. Working almost exclusively for 24 months, on this project, Ken Faraoni used a technique called “lost- wax casting”. He created about 30 molds backed with plaster and poured casting wax into them. Once he cleaned up the wax he took the pieces to Colorado where they were put together and a ceramic shell was created around the wax. Liquid bronze was poured into the wax. Once the bronze had cooled the ceramic pieces were hit with a hammer and the bronze recasting was left behind. After smoothing out the recasting, a painstaking procedure, the final polishing was completed followed by a few coats of lacquer. The statue was now ready to be displayed. On a pleasantly warm, sunny day the recreated Water Bearer was unveiled to a large crowd of onlookers, who gasped when the beautifully recasted Water Bearer sculpture was revealed. The statue is now a landmark of the work that the city of Lynchburg has accomplished in it’s revitalization and guides the way to the future of downtown. Take the time to walk along Lower Bluff Walk. Stop in one of the delicious restaurants for a meal or beverage. Or just sit on a park bench and enjoy the view of Riverfront Park and the James River. The Water Bearer is a pleasant walk from the Carriage House Inn B & B. And once at the statue you can wander through downtown or onto Percival’s Island or the Blackwater Creek Trail. 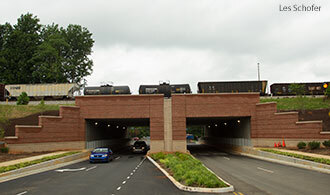 Liberty University opened a new entrance onto their campus last May with the completion of their new tunnel that goes under the Norfolk-Southern railroad tracks.. What made this project unique and interesting, at least from my point of view, is how the tunnel was constructed. The tunnels were prefabricated and shipped to the site. 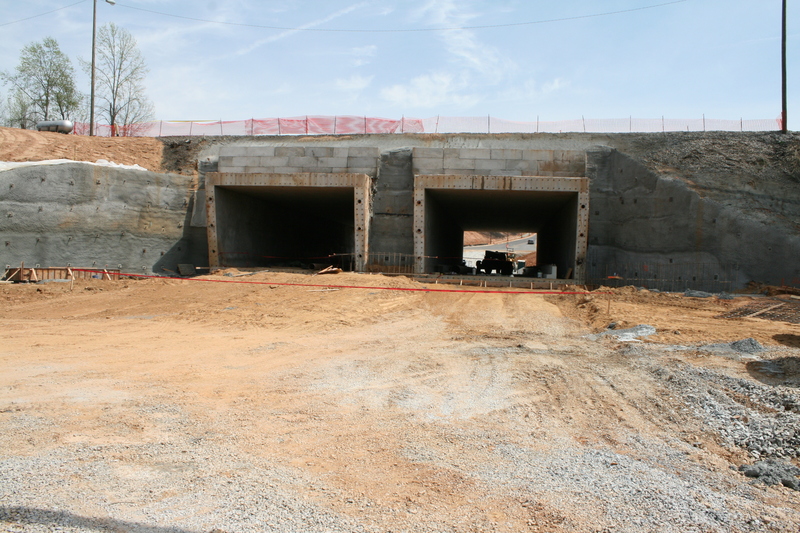 Each tunnel is a large concrete box weighing 4.2 million pounds and measuring 26 feet tall, 32 feet wide and 130 feet long. A large concrete pad was constructed and these massive concrete boxes were positioned on the pad on the Liberty University side of the tracks. The boxes were pulled and pushed through the soil until they broke through the other side. On the “other side” of the tracks the ground was reinforced with steel and concrete and holes were drilled through to the Liberty University campus side and cables were run through and connected to the concrete boxes that would be pulled through. The boxes were equipped with cutting edges to aid in the process. When pulling with the cables wasn’t sufficient to move these giant boxes they were also pushed. As the boxes were being pushed and pulled, excavating equipment was in the box to remove the earth as it made its way under the railroad tracks. 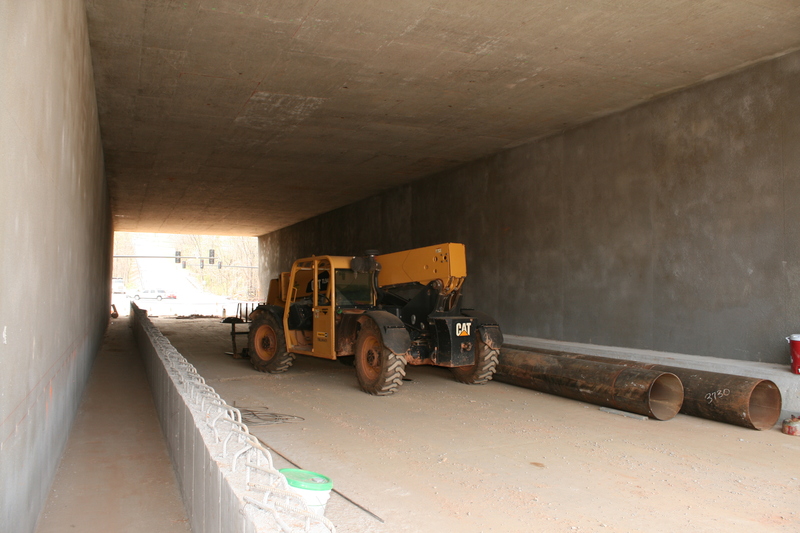 This is the first time that this type of tunnel construction had been done in North America. During the entire process, engineers from Norfolk-Southern were on site to ensure the earth below the tracks was solid so that trains passing overhead wouldn’t derail. 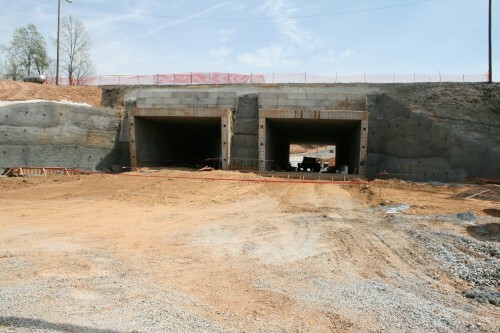 After breaking through to the other side (Wards Road), pavement was put down and the tunnel was opened for traffic just in time for Liberty University’s 2013 graduation. Since its opening the entrances on both sides have undergone some cosmetic improvements such as bricking the walls, landscaping, adding lighting and putting in a pedestrian walkway. Today, driving through the tunnels one would never think about how they got here, but I found it very interesting to watch the process. To most it is just a tunnel but to me, it is a project that demonstrated man’s ability to think outside the box in problem solving. Next time you drive by the tunnel imagine what it took to drag/pull a 4.2 million pound box of concrete through the earth. 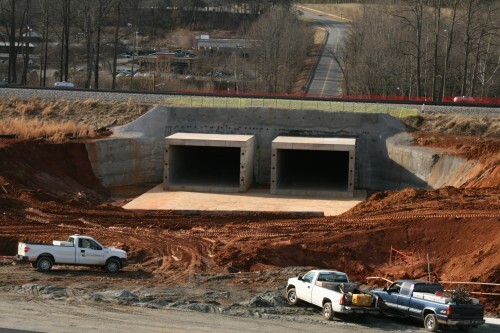 While the tunnel will never be a tourist attraction in Lynchburg or for Liberty University, the story about how it got here is worth remembering. 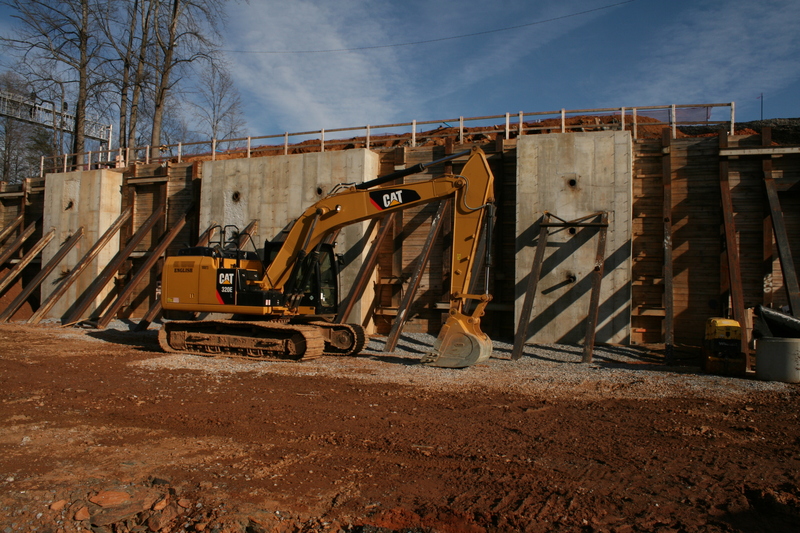 Recently the tunnel construction project was named best Small Project (under $10 million) in the MidAtlantic region, consisting of Delaware, Maryland, Pennsylvania, Virginia, West Virginia, and the District of Columbia by Engineering News-Record (ENR) MidAtlantic, a magazine and website for construction industry professionals. There are many things to do and see during your stay at The Carriage House Inn Bed and Breakfast, but if you drive by the tunnel perhaps now you can appreciate the story of “The Tunnel” as we now call it. The Carriage House Inn Bed and Breakfast, in Lynchburg, VA, is proud to announce we have been mentioned in the October issue of Blue Ridge Country magazine! The featured article this month is “50 Great Things to Do and See this Fall“. Starting in North Carolina and working their way through the eight states highlighted each month that make up Blue Ridge Country (Georgia, Kentucky, Maryland, North Carolina, South Carolina, Tennessee, West Virginia and of course, Virginia) a treasure trove of suggestions are included. Beyond viewing leaves and luscious fall colors there are peaks to climb, rivers to forge or float, wine trails to taste, farms to purchase fresh produce or cheese, trails to hike or bike, campgrounds and parks to explore, relaxing places to stay and delicious places to eat. As promised, 50 things to see, do or experience all within a drive from where you live. What are you waiting for? Get your copy of the most recent issue, decide where you would like to travel to this fall and make your plans. If you’re lucky enough to live in Lynchburg you don’t even need to travel. Why not plan a vacation without leaving Lynchburg? Check in to our magnificently restored mansion, indulge in our 4-course breakfast each morning, take the time to explore all that Lynchburg has to offer (arts, trails, museums, wineries, outdoor activities) and spend some time, quality time, with your loved one. Call us 434.846.1388. We have a variety of packages and specials offered this fall. We’re looking forward to seeing you enjoy Lynchburg and the surrounding counties. Don’t delay, rooms are booking up! Lynchburg, Virginia is one of the newest locations, in the United States, of the Little Free Library project. In 2009, Todd Bol, a resident of Hudson, Wisconsin started the movement. He built a model of a one room schoolhouse as a tribute to his mother, a former teacher and avid reader. He filled it with books, put it on a post in his front yard with a sign FREE BOOKS and his friends and neighbors loved it. 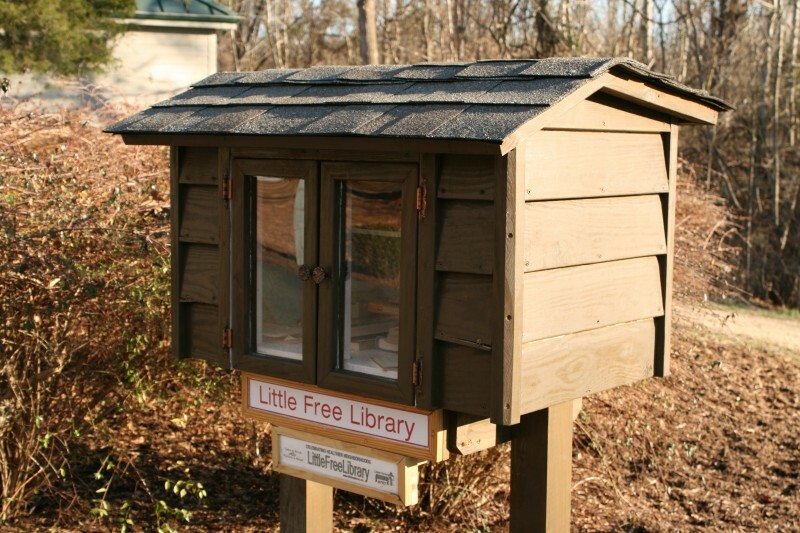 He and his friends set a goal of 2,510 Little Free Libraries throughout the United States by January 2014. They estimate that by year’s end there will be over 10,000 small structures promoting the slogan take a book, return a book, far surpassing their goal. Little Library on the Blackwater Creek trail head. 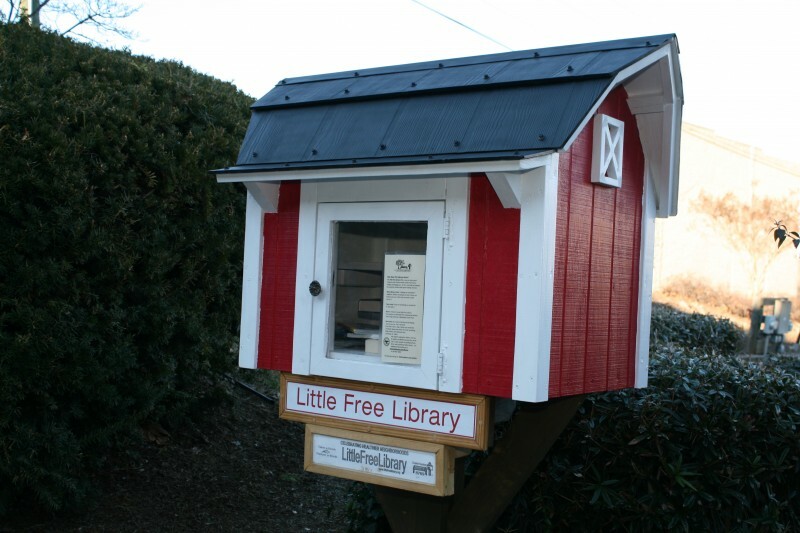 Lynchburg has debuted four little libraries throughout the city. They are located at the Community Market, Riverside Park, the Ed Page Entrance of the Blackwater Creek Trail and at WordWorks located on the roundabout on Fifth Street. Books are selected by a “Steward.” Depending on the Steward and little library location the books may follow a theme, for instance the Blackwater Creek library has several bird watching books. The goal of the Little Free Library project is to share favorite books and to grant access to people who don’t have books, allowing them to stop and take a book. For more information stop by and take a book or visit the website www.littlefreelibrary.org. VCCA-a local retreat for artists from around the world. The Virginia Center for Creative Arts (VCCA) is located off RT 29 on property owned by Sweet Briar College, known as Mt. San Angelo Estate. It is a sanctuary where artists can find serenity, light, space and privacy to work for hours, days or weeks on their creative works in private studios cradled on 400 acres of rolling farmland. If you have ever tired to write that great American novel, or paint a masterpiece or sculpt a piece of clay, marble or wood into art or compose a song or opera you know the distractions of life often get in the way and that project gets delayed or remains unfinished. The VCCA offers its artist residents, Fellows, a comfortable, private bedroom, three meals a day, and a private studio. While there the artist has a quiet light filled studio to work in but has the ability to share thoughts and ideas with over 20 other artists. The results speak for themselves, VCCA residents have won a Pulitzer Prize, written many NY Times best sellers, had movies made and have had their art shown at top galleries around the world. To get a fellowship at VCCA you must apply and be accepted. The application process can be found on their website. During the Civil War, estate owner Elizabeth Mosby traveled to Europe and brought back architect Thomas Eastlock from England to create the original 1870 Italianate villa. Upon her death the estate then known as Mount Saint Angelo went to her brother and upon his death the estate was transferred to Elizabeth Mosby’s Sister, Indiana Fletcher Williams, the founder of Sweet Briar College (founded in 1901). In 1909 the house was remodeled into a Georgian Revival mansion. 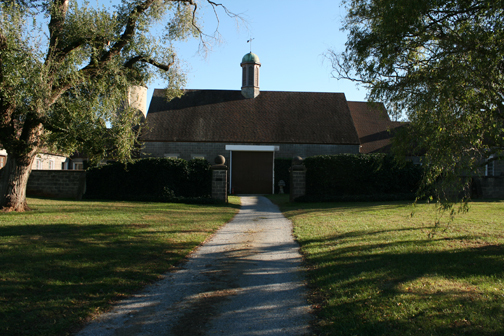 In the 1920s a 13,000 square foot Normandy-style barn complex was built which now houses the artist studios. The name was changed to Mount San Angelo in the 1930’s. In 1968 Sweet Briar College purchased the property and in the fall of 1977 Sweet Briar College agreed to lease the facility to VCCA. On July 17th 1979 the mansion was destroyed by fire. At the time there were fifty six VCCA Fellows in residence. Over the next two years Fellows lived and worked in the barn complex. Today the residence hall, completed in 1981, can house up to 22 Fellows. The Studio Barn complex (built in 1932) is just a short walk from the residence hall and houses 22 studios, 3 kitchens an exhibition hall and sculpture gardens. 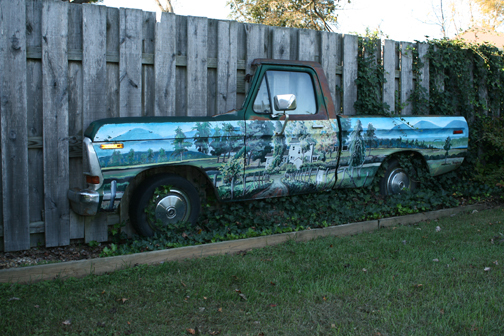 Pick up truck sculpture on the grounds of VCCA. From time to time VCCU has an open house where the public is invited to visit the property and grounds and mingle with the artists. Last October during their open house I met several interesting artists that were from Europe and the United States. The VCCA is a creative space for writers, artists and composers from across the nation and around the world. It is also a great place to visit when they host their annual open house! If you are looking for a quiet place to relax and get creative and you aren’t accepted as a Fellow at VCCA then we invite you to check into The Carriage House Inn Bed and Breakfast and take advantage of our quiet 1878 mansion or 1910 carriage house. It may be the place that inspires your creative energies. VCCA is having an open house Sunday January 19th, 2014 from 2:00-4:00PM. Tour open studios and visit with working writers, composers and artists. If you are interested in the arts this is a must see.